Up for sale is a vintage diecast (mostly diecast) toy from the 80s(? ), named The Henshin Robo. Diehard mech fans will recognize this design from Mospeada or maybe Macross. A very cool robot toy brought to us by Gakken. 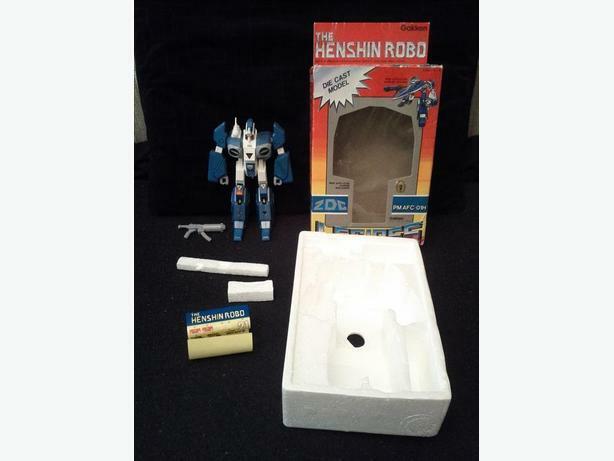 Still has the box and styrofoam, as well as the gun and stickers! Pretty sweet! Why deal with flimsy overpriced modern transforming robots when you can have the real deal from back when toys were shown the proper respect! $80! A better price than what you'll find on a certain online auction site!